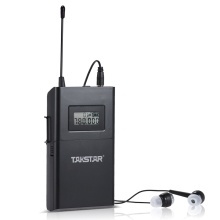 Wireless receiver for Takstar WPM-200 wireless system, 50 meters effective range. UHF 780-805MHz frequency band, 6 selectable channels to match your need better. With a backside clip for fixing it onto the top of trousers. Comes with a earphone for convenient usage.